Description: This implosion had to be one of the coolest things that I have ever shot with a drone. Watching the footage live and then feeling the impact of the shockwave on my chest was surreal. 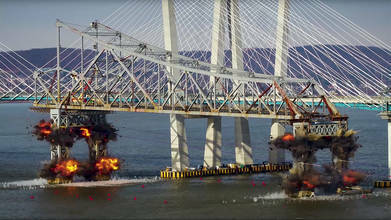 The original plans were to avoid the use of explosives that could have an impact on fish habitats, but experts determined the old bridge was structurally unsound, preventing workers from continuing a piecemeal takedown. To record audio, I set up a separate camera, with a big microphone pointing at the bridge which was mostly blocked by a tree. Unfortunately, people assumed that my “fancy camera” was an indication that it was the best viewing spot so they surround the camera and got their own cameras ready while they chatted directly into my microphone. Despite the fact that I keep telling them that the best spot for a photo was about 50 feet to the left (and that's true BTW) they stuck around. I asked them multiple times not to try and talk directly into the mic... they ignored me. My favorite line, from their constant talking, start at :27seconds.